Once upon a time there was a brand-new bride who was preparing her very first holiday dinner for her husband’s family. When it came time to put the food on the table, everyone noticed something odd about her baked ham– both the ends were cut off. They all ate politely, and it certainly was delicious, but later her mother-in-law pulled her aside and asked the young woman why she had cut the ends off the ham. So, the bride went to visit her 92-year-old grandmother in the nursing home. “Grandma,” she began, taking the aged woman’s hand. “Can you tell me why you always cut the ends off the baked ham? Did it make it juicier somehow? Did it make it cook more evenly?” She had obviously put a lot of thought into the matter. I just love this story. Everyone who knows me knows that I’m passionate about project management, but this simple tale illustrates the need for my other secret passion– business analysis. I can tell you — even in the business world — people are mutilating a lot of hams. In the early days of project management, business analysis was primarily cut-and-dry. Business analysts were responsible for documenting written requirements for projects. Lately, however, the business analysis profession has gotten a makeover, transforming into something more. Here at Solarity, BA not only stands for Business Analysis, but also Business Advising. As a business advisor, I get to search out those hidden stumbling blocks that are slowing my clients down and help them develop new, better ways of doing business. Let’s face it– we can never get more hours in a day. That’s just not going to happen in the physical universe we inhabit. But if I can analyze a client’s environment and help them work smarter rather than harder, then at the end of the day they are going to feel like they squeezed a few more hours out of that day. First, I work with clients to map their processes, charting out what they do and how they do it. Then I get in there with a magnifying glass and ask the questions that we typically don’t ask ourselves when we’re too close to something. Why do you do that step? Do you really need that step? How long does that step take? What if we eliminate it? If one unnecessary step eats up 30 minutes of an employee’s workday, then by eliminating it, I just freed up 2.5 hours a week of company time. The solutions are often simple and elegant. They improve not only our clients’ processes, but their end product, and their future end products as well. At Solarity, we pride ourselves on being trusted business advisors, not just conventional business analysts. With Solarity, you get the whole ham. And maybe a side of potatoes, too. 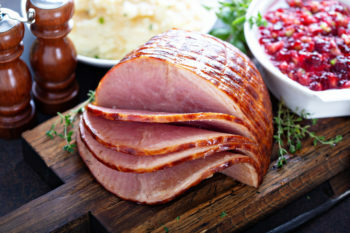 And, just in case you’re wondering……at Solarity, we too are working to get the whole ham! Check out how, LINK. You can also see one example of how we have done this internally HERE. Sue Knies, PMP, CSSBB is the Director of Practice Management and Instructor with Solarity. Sue provides consulting services to organizations by managing key projects, and working with employees to improve and strengthen their project management skills. As an instructor, she develops and enhances courseware, teaches and mentors students in project management, and helps translate best practices and principles into approaches that are readily understood and utilized. Prior to joining Solarity, Sue had a long and distinguished career with IBM, working with worldwide, cross-divisional teams, collaborating with clients, and managing projects that yielded client solutions, drove growth and expanded wallet share. Additionally, Sue is an active member of the PMI® KY Bluegrass Chapter and has served on the Chapter Board in various offices such as President and VP of Programs. Our mission is to help people, organizations, and communities THRIVE! Our broad range of experience and knowledge in a range of different industries allows us to customize our approach to fit the situation. We work in total partnership with our clients to understand their business needs and the current environment, and then match the right amount of process to meet the culture and the project.